Traditionally we have always fed our dogs from a bowl, however, there are other more interesting, challenging ways to feed your dog especially if you feed a good quality kibble such as the ones you’ll find in our on-line shop. There are puzzle games/toys such as those made by Trixie. Here is my border collie using the Trixie Turn Around Activity game. At breakfast time he is fed one of the Grain Free complete dog foods so I took the opportunity to feed his breakfast from this challenging game, rather than a bowl. If I put his Happy Nose dog food in the bowl, it is eaten in seconds! But, fed from the Turn Around or similar games, it takes longer and gives him the mental stimulation a lot of dogs need. 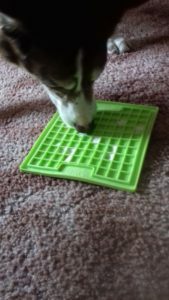 Another type of puzzle to use for feeding your dog is the Snuffle Mat. It is made from fleece and you hide your dogs kibble in it for them to “search” for, again giving them the mental stimulation they require, and also keeping them entertained for a while. In this video, my boy is eating his Happy Nose Natural Fish & Rice kibble from his Snuffle mat. 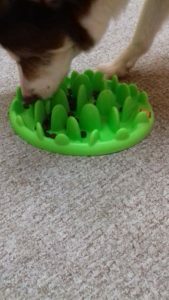 There is also the Company of Animals Green slow dog feeder, again simply scatter your dogs food over the “green” it turns your dogs meal into a time consuming game, slowing down eating which in turn can help reduce “bloat”. 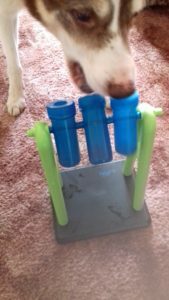 The Green slow dog feeder can be used with Happy Nose dry dog food or your dogs favourite wet food. The Lick-i-Mat treat mat is also great for wet food.